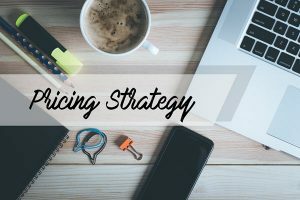 Do you ever wonder how you should price your services? Maybe you wonder how much you are worth to your clients? Pricing is one of the biggest stumbling blocks for entrepreneurs. It is fairly easy to price a physical product. You look at the cost of your materials, your overhead, add in your profit, and you are done. Pricing services is trickier because while your costs appear to be lower, your services probably require more of your time and time is a limited commodity. When I started coaching, I had no idea what to charge for my services. I asked my coach and he gave me a guideline. As I got better at coaching and my clients started seeing true results, I raised my prices. I raise my prices each year and my clients renew because they can afford it. Their businesses have grown because of the work we do together. How to price your services! Whether you are selling coaching, consulting, bookkeeping or any other kind of service it’s important to understand that you never price your services based on your competition. When building a business there are 3 ways to compete. Price – this is the “Walmart model” and should never be an approach for your service based business. Quality – this is the “Cadillac model” or the “Starbucks model”. A premium is paid because of the experience that is created for the client. This is the model for service providers so that you are paid what you are worth. Convenience – this is the idea behind bottled water or some of the coaching tools you may be using to make your business easier. Convenience also commands a premium price. A major issue I see with entrepreneurs is that they can’t seem to recognize the value of their work. If you are struggling to see your value then answer these questions about a client that you have worked with, and not just any client; think about a client you love working with. What did your client gain from working with you? What change did they experience? Did they lose 100 lbs or make $50,000 or find their long lost parents or finally mend the relationship with their child? Every change has a value. What is it worth to someone to lose 100 pounds or to have a great relationship with their child? Now I want you to think about the opposite. If your client had not worked with you, what would be different for them? What would they not have? Or maybe what would they still have? You should begin to think about what they are losing by not working with you. There are costs attached to everything in life. For example, what does it cost a family to have a child that is out of control – medication, therapy, boarding school, not to mention the cost attached to the stress parents feel. Setting your price isn’t about greed (Ok, it shouldn’t be about greed). If you are just getting started in your business then the next thing to look at are your numbers. What are your expenses? What is it going to cost you to provide your services to a client? What are your indirect expenses, your overhead such as your office expense, insurance, employees, etc? How much would you like to be paid each month?This number should cover all of your personal expenses and the amount you would like to save each month. How many clients can you and your team handle in a month? Be careful not to overestimate this. Let’s say for example that you tell me that $20,000 covers your expenses both business and personal. Then you tell me that you and your team can handle work with 16 clients per month. If you were to find 16 clients that paid you $1,250 per month then you have reached your $20,000. What can you sell them for $1,250? Please, please, please pay attention! I know it may be hard to believe but most sales are not lost because of the price. The problem is that you are not clear about how to hold a sales conversation that is emotional and leads someone to buy your services. I tell my consulting clients all the time that if you are a consultant, you can not help them until they hire you. It is important that you have powerful sales conversations. I didn’t say pushy or manipulative sales conversations. I am here to tell you it is not the price. Let me give you an example. How much is an ink pen that writes in purple worth? $2? What if I told you that I would give you $1,000,000 if you sign your signature on my piece of paper in purple ink. How much would you be willing to pay for that ink pen? $100? $1,000? $5,000? Do you see my point? **Get help with your sales conversations with Results Based Selling. Please help with my sales conversation! So, now it is your turn. How did you set your prices when you started out? How has your pricing changed over time? Everyone would love to hear your advice too.